A black and white negative of a sheep standing by a bush that has flowers on it. There is a wooden fence behind the bush. A lamb can be seen in the distance. The negative envelope states that the unidentified farm is in "Durham County". 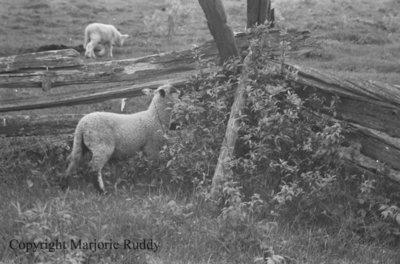 Sheep, May 23, 1938, Marjorie Ruddy. Whitby Archives A2013_040_981C.